Being a good musician is hard, but being a good leader of musicians can be even harder. Every band needs to have someone who's “in charge” in some way, though what that means varies from group to group. This person needs to help ensure that projects are completed on time, make creative decisions, and ensure that things are running as smoothly as possible within the group. As you start up your new band, figure out who's going to be the bandleader from the beginning, and then do your best to make sure that person picks up these mental habits. If that person is you, pay attention! While you may be the bandleader, the entire project is nothing without your mates, and you need to make sure to dedicate the same amount of resources to all of them equally. What does that mean? Well, you only have so many hours in a day, and while it may feel like it sometimes, you don’t spend all of it with your bandmates. 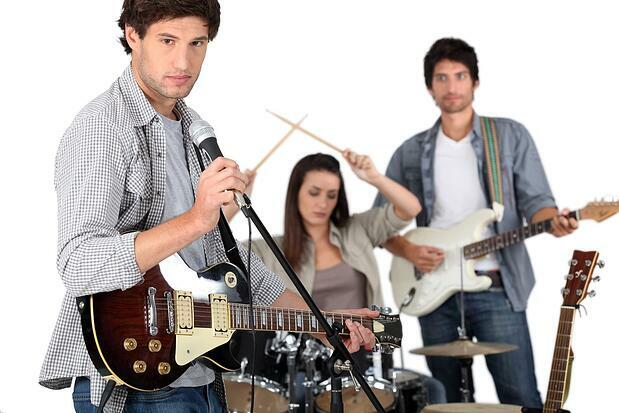 Do your best to make sure that you split your time and attention fairly among all of your bandmates. It’s sort of like raising children (although not even close): make sure you treat everyone the same, otherwise people could end up feeling left out. That could lead to rifts within the band, and that will affect the music you make and your live performance. When you're doing anything involving your fellow band members, do everything possible to ensure that your attention is as evenly divided as possible. Anyone who's ever worked on a team for anything – a school project, a business, or a band – knows that different people are better at different things. Everyone has strengths and weaknesses, and being a good leader of any kind isn’t about minimizing them; it’s about recognizing and strategizing around them. While you’re working on new music or accepting gigs, keep in mind what everyone is good and bad at. If one of your bandmates hates playing three shows in a day, perhaps stay away from taking too much on in one day. If someone is uncomfortable sharing lyrics, try to minimize the pressure to share, at least until he or she becomes more comfortable. Keeping in mind what everyone does best will allow them to excel and shine, and when everyone gets a chance in the spotlight and does their best work, the entire band will benefit. If you’re going to be a the bandleader, you need to be a good leader, of course. If you’re going to effectively lead a group of people, you need to be confident in your decisions, and that means not second-guessing yourself. That's an incredibly difficult mental habit to develop: second-guessing is natural, but not efficient, and it’s a very bad quality to have as a leader. Take your time when making big decisions, and think everything out carefully. Talk to people involved in your career, as well as those that have some insight into what you’re looking at. Discuss with your bandmates, and take their opinions and thoughts into account. Once you’ve made a decision and made it public, stick with it. There are few instances where backtracking or changing your mind afterwards is okay, and second-guessing will lead you to bad places. This might sound obvious, but it’s actually tougher than you think. If your bandmates see you set unrealistic goals that appear completely out of reach, they won’t feel motivated to make them happen. On top of that, if you set goals that are all but impossible, then you and your bandmates fail to meet that mark time and time again, they'll quickly lose confidence in your leadership. Instead of telling them that your band needs to have your first album go platinum before you’ve even developed a fanbase, why not see if you can move 1,000 copies, all the while keeping in mind that one day you’d like to be the type of act that can shift one million? Doing the thing you said you were going to do helps instill confidence, and it makes people want to trust you and follow your lead time after time – just look at any politician who’s made it work. It’s only human to favor some things over others, especially when it comes to people. That’s something you need to overcome if you’re going to be an effective bandleader. When you’re crafting new tunes or making band-related decisions, try not to weigh any one person’s opinions or thoughts over anyone else's, at least not for insufficient reasons. If one of the members of your band knows a lot about what makes a successful tour, his or her word can carry more weight than that of others when it comes to specifics, but you shouldn’t go into these decisions being biased based on what you like or who you don’t like. Remaining objective is tough, and it takes a lot of work, but it’s necessary to being a successful and fair bandleader. You’ll have to consciously decide why you’re picking certain things or listening to one person over another, but that’s one of your responsibilities as the one in charge.